Well somebody sure is gloating over the destruction. I see it as another manufactured event that attempts to induce mass trauma. So my defence is not to react with despair. It is the same with the destruction of the ancient Buddha statues in Afghanistan — these news events are designed to traumatize us. It worked on me then; it doesn’t anymore. The same people who destroyed the Citadel of Christianity are the same people who looted Syria and Iraq; who blasted away the statues in Afghanistan. They are the Masters of Discourse and a key part of that mastery is filling our minds with fear and loathing. I have only this to say to those people: you have failed. I look on with cold eyes at the destruction. Paris and the Parisians already had their hearts destroyed by you a long time ago. The fall of the Cathedral is just THEIR triumphant declaration of victory. But they have no power over me or my mind or my soul and see more and more clearly everyday where they lurk and leer. Just look at that Sun headline and its nasty joke. We all know who runs the media. The same people that run our governments, law enforcement (what laws!) and intelligence services. This is a deliberate, symbolic act of destruction. However, they are only destroying themselves for we all live in the same world. They cannot feed off my despair anymore. If others do the same, perhaps they will only have themselves to consume, and they will either fade away or wise up. They are not better than me; they are not Chosen. They have merely chosen a darker path. I have nothing to give Paris — it has been dead to me for a long, long time. Just look at that Sun headline and its nasty joke. 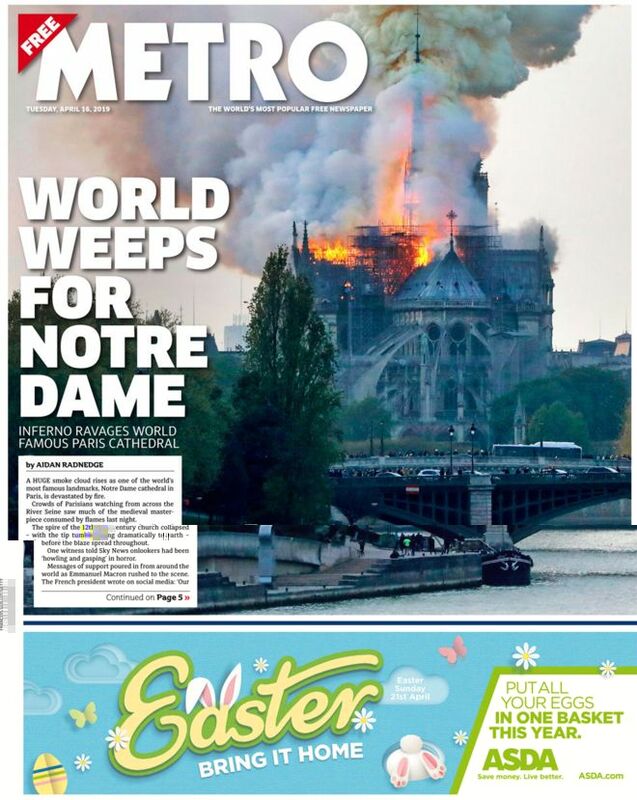 Yes, these coldhearted swine can’t resist a cheap joke for a clever headline like NOTRE DOOM. They specialize in cleverclog headlines even in the midst of tragedy. They’d crack a joke even at the grave sides of their own mothers just to get a pat on the back from their equally depraved editors. When the Brits destroyed a ship full of Argentinian fighters defending their country in the Falklands War, the Sun newspaper raised a sick laugh by their pithy headline: GOTCHA! Lots of sick jokes out there about Jesus Christ, you will note, to delight the hearts of the mentally deranged masses — but just try joking about Auschwitz or gas ovens! Oy veh! To most normal people, they were not even “fighters”. They were naval conscripts heading back to Argentina, in international waters, outside of the 200-mile “exclusion zone” declared by the Britniks. The ship, the Belgrano, was so old it had been sunk at Pearl Harbor and was to have been turned into a museum at the end of the year. It’s largest gun had a 15-mile range compared to the standard 20-mile range on British ships, and was sunk with 2 torpedoes from an atomic submarine. In other words, it posed no military threat to anyone whatsoever. The British captain, a certain Capt. Wreford-Brown, sailed back to London and was awarded with a medal. Prior this incident, not a single British subject, settler, sailor, pilot, or soldier, had yet been killed. This was obviously done simply to provoke a war, which was widely considered too absurd to be likely, and served really as a weapons demonstration for the benefits of European weapons systems manufacturers. As far as I’m concerned, Paris “died” in August, 1944 when the city was, ahem, “liberated” by the Allied forces. Had Germany prevailed, France would have gotten over their “defeat” because the Germans would have made sure that French sovereignty remain intact, as well as the rest of a TRULY liberated Europe. Exactly. The same tribal chauvinistic mob runs ISIS/ISIL, have destroyed WTC, Palmyra and have been organizing terroristic assaults in France, UK, Spain, Germany, Belgium etc. And yes, they are chosen people, no doubts, they are chosen by satan. “NOTRE DOOM”..!! Is that the best jew Murdock’s SUN can come up with?? That is proof of the message he and his ilk want to be sent around the world in the UK’s largest ‘daily’: Christians are doomed! Horrific event! Renovation of a really old building and S##T happens! But no it cant be an accident. Greater purpose says Pat. To send a message, I say you got us! Here at LD it only took a few comments before this unfortunate event got linked to us Jews. Well if we’ll start jumping to conclusions, I’d say it’s rather the Muslims. Jews do a lot of damage but did Jews order the Teleban to bomb the giant Buddha statues in the mountain face? Jews may hate Christianity but Muslims hate all culture except their own. That seems a perfectly reasonable and well-balanced comment to me. Though there’s always the possibility that the Jews are the puppetmasters who secretly control the Muslims and are using the Muslims as their tools and pawns on the chessboard. Aren’t the Jews behind White genocide, the floooding of Europe with millions of Muslims? Doesn’t the Jewess Barbara Spectre admit that Jews are behing the multiculturalism and uncontrolled mass emigration that has turned Europe into a Muslim cesspit? Not the Jews Ralan, never the Jews! The hateful Muslims did it, we should attack Iran right now! jew Murdock’s SUN fired the first shot when the headlines proudly displayed “NOTRE DOOM”! Stop bragging! I would never raise you to the status of jew Murdock and his ilk – his peers. November 15, 2010 – Jacob Rothschild will join Rupert Murdoch on Genie Energy’s Strategic Advisory Board and Jacob Rothschild’s interests will partner with Genie Energy to raise capital for the eventual commercialization of its oil shale projects. George Soros & Soros Fund Management LLC, are heavily invested in News Corp, parent company of Fox News. You are a lowly jew! jew Rupert Murdoch is the founder, Chairman of the Board, and CEO of News Corporation, one of the world’s largest diversified media companies. News Corporation’s holdings include Fox Entertainment, The Wall Street Journal, the New York Post, HarperCollins and significant other media assets on six continents. How very amusing. Remind me to laugh. I don’t want to get into a dispute about the rights and wrongs of that war but Britain went to recapture an island occupied by the Argentinian military some 500 km from the Argentine coast, yet nobody, except Turkey, would dispute the right of Greece to defend Lesbos, only 20 km from the Turkish coast. What I find interesting about that war is that no NATO country supported Britain and many were critical of British actions to regain the island. I thought that NATO had some policy that an attack on one NATO country is an attack on all of NATO. So what happened there? Does that rule apply only in Europe? Does it even exist, or is it something conjured up for media purposes? If it was meant specifically for dealing with aggression by the Warsaw Pact, well that doesn’t exist any more, so how applicable is it? Of course in the case of skirmishes over Greek islands close to Turkey NATO can’t pick a side as both are NATO members. Mike, two ways US/NATO aided and abetted Britain as per the Falklands War. Both absolutely instrumental to their victory. 1) France refused selling anymore Exocet sea skimming missiles to the Argentines who only had four or five when the conflict started. Had the Argentines, with their well trained air force and excellent pilots possessed and deployed a dozen or two more Exocets, the entire British Expeditionary force would still be on the bottom. The Argentines sank six British ships with the four Exocets they had combined with bombing attacks. 2) As per the Argentine pilots themselves, the real hero of the Falklands war was the AIM 9 Sidewinder air to air missile which the US navy off-loaded to the British after meeting them in the middle of the Atlantic halfway to the Falklands. The British Harriers were no match for the Argentine’s Mirage, Dassault Super Étendard and A-4 Skyhawks of the Argentine airforce without the AIM 9 which more than leveled the air to air combat playing field. So yes the US/NATO did indeed aid the Btirts and if thet hadn’t the entire mission would have been a disastrous mismatch, an abject failure..
P.S. The sinking of the General Belgrano was a revenge attack and widely viewed by militaries around the world as British perfidy. events. Practically routinely. They have a sterling reputation among avaitors. Well, at least 40 years ago they did. Al Aqsa mosque in Jerusalem burned yesterday as well. So obvious who’s responsible. You mean a cohencidence? Probably to take focus off the arson in Jerusalem. That is my take on it. Besides the tragedy to the Western Christian World, and symbols are important to the human heart, the Notre Dame’s fire is indeed a distraction to the arson in Jerusalem. The Third Temple is a central goal to that vicious Theocratic Nation, a self-fulfilled “prophesy”. As a Military operation, both events were coordinated like a mechanical clock! Step D – the Third Temple is built (?). I have always been against the Zionist Jewish project because it has been built on the theft of Palestinian land, but trying to look at it from the point of view of the Christians who believe in the End of Days prophecy and await the second coming of Jesus shouldn’t we be trying to accelerate the process? I think this is where the cooperation of those termed Christian Zionists with Israel comes from, not from any actual love for Israel and Jews. I also think that some of them believe that in the final stages many Jews will convert to Christianity. Maybe someone better versed in this can explain but I somehow doubt that these Christians really want a world run by Zionists where Christians will play second fiddle. But they’ll definitely work with the Jews in the above steps. What gets me is that to get to Step G you have to work to realise Step F. Of course many who believe in the prophecy do not work towards any of that as they claim it will happen of its own accord so they neither try to prevent, slow down, nor accelerate the process, but my impression is that those Christian Zionists are simply impatient accelerationists. You can also see how the Jews may be using the Christian Zionists to get to stages E and F and then dump them. Yes, I know it sounds ridiculous to be discussing such matters but they loom very real in the minds of many faithful Christians especially given the Book of Revelation. Thankyou. I agree totaly with what you say, byt if you do a net search there have been many recent church fires in France . their hatred of christianity is reaching its climax, for years they have said jesus and his followers will boil for eternity in a vat of excrement, but who is heading for the excrement now ? From today we refuse to spend our money in jewish shops and supermarkets, we do not buy israeli goods. But in the end only force will be the key to dismantling JEW power. It is always reasonable and prudent to point the finger directly at the JEWS. Erasing Western culture is part and parcel of the JEWS plan to erase Western people. of tbe founding family that Adolf Hitler himself chose to make the uniforms for the Nazi’s and who were Nazi’s. Because somehow this hurts the Jews. If people lived separately in their own ethnic states then we wouldn’t be having any of these problems and worries would we? This is the problem with globalism, it is just adding to and exacerbating all these problems instead of solving them. Some people sure can mix well but these are very few, and with open borders they are not attracting those adaptable types. You, for example, may be one who mixes well with other nationalities, religions, and races, and that’s fine, but what happens when they bring into your environment a multitude of those who don’t and won’t? And this is what is happening with the Muslim invasion, you will be forced to adapt to them as they surely won’t adapt to your society. So for example, women will have to change their dress and behaviour to avoid being raped, husbands and fathers will have to keep womenfolk behind closed doors and tall walls and chaperone them to school, work, church, etc. just as they do in Muslim countries. They hate and despise your ways and your culture and they are showing it to you by the way they dress and act. You may think it’s just them dressing in their folklore costumes, but it’s more than that; it’s a real cultural war going on out there and it’s completely unnecessary, since they could have stayed in their countries practicing their lifestyles without causing any friction to anyone else or imposing their ways on others. Surely you are aware of what is going on and how this will develop. Third temple insanity. Al Aqsa also reportedly on fire. The devil digs his own pit. much less 200, or 1000. This is too sad!! My heart goes out to the people of Paris who are in such shock and grief. I am so sorry! My mind, though, goes elsewhere into suspicion that this was arson and so even at the risk of sounding callus I have to wonder who did it. Well… it does seem that Femen headed up by Anna Hutsol and her buddy Inna Shevchenko have been desecrating a lot of Christian churches of late. But that doesn’t mean that bare-breasted women actually somehow got into the Cathedral to light the fire… No, they are more like the front (sorry for the pun) of something far more sinister, such as the evil master of destruction, George Soros, who funds Femen. Femen like all George Soros props love to desecrate “Western Civilization” which they despise. When asked why they only desecrate Christian and Muslim shrines and not Jewish they sneered and the (Jewish) lawyers took over. So… I hate to say what I suspect, and so I won’t say it. Only, don’t blame the Muslims–the Wrong Abrahamic faith…. This has got to end! Don’t give asylum to any George Soros group, which is like inviting antibiotic resistant runaway fungal infection into the hospital. It is one of those odd coincidences, that is never really an odd coincidence, that of one of the greatest of all Christian religious icons burned to the ground (or might that be holocausted?) at the beginning of Christianity’s most Holy Week. This is the week commemorating Jesus’ arrival in Jerusalem, just a few days before he was crucified during the feast of the Paschal lamb. This monumental event has the poisonous stink of Jew arsonic all over it. Cowardly Jews become increasingly brave as their power has now grown to overwhelming dominance over western civilization’s white nations. Finding no resistance to their predation upon the white west, Jewish political jackboots are now openly stomping the white man’s face into the mud of Jewish perversity. As Jews openly call for the murder of the white race, followed by relentless mental and physical attacks on all fronts, the white man does nothing but cower in abject fear of being called “anti-Semitic,” followed by groveling apologies for being white. Everywhere white civilization is in collapsing, retreating on all fronts, as war and revolution looms close on the horizon. For Jews, Notre Dame presented a twofer masturbation fantasy exceeding even that of crucifying Christian children upside down to drain their blood. First, for Jews and Muslims, the fire presents a highly symbolic event, presaging the final destruction of western civilization’s foundational underpinnings. Perhaps you are already aware of the intensely vehement, vitriolic hatred Jews have held for Christianity since the day the Jew, Saul/Paul, began usurping the Temple’s power with his new religion. What is history if not bizarrely ironic? Even more tellingly (((they))) also burned the al-Aqsa mosque in neo-Jewrusalem. In fact, Notre Dame was most likely a news cover for the real agenda of attempting to destroy the mosque, as with the mosque gone, Jews will begin building their “third” Temple so they can begin sacrificing “gentile” children on their altar of blood. The beginning of the third Temple will signal the Jew god’s victory over the “gentiles,” the “Amalekites” the “beasts of the fields,” made in the image of man to serve the Jew. Remember, there is no accident, no happenstance, no coincidence, all is by design. In this case it’z Jewish design. (((They))) destroyed the cultural icons of the old south, now they destroy Notre Dame. The only remaining question is how long before Jews destroy you? I saw a video on Adam Green’s Know More News merely a few weeks ago. Seems like the jews already have the pieces in place somewhere in Israel. So they can start assemble all the pieces as soon as the mosque is gone. Not only that, Jews have trained the priesthood in the religious ceremonies of the old Temple. This means a return to the blood sacrifice. This is the same corrupt religious system Jesus gave his life to end. Jesus must be turning over in his grave. Oh wait, silly me! I forget the Jews tell us he rose into heaven on the third day body intact. This means he must be turning over in heaven right now. Ring, Ring, Ring . . . Thank you, AS, for writing and posting at least some of what needs saying, repeating, and communicating. Immediately. Stand up or stand down. No in-the-between now, gray area denizens! Oh, the terrible dialectics confronting us. We need a triangle to escape the poles of duality that pull us apart! There are several triangles in play. We have now to pay attention, observe, document, assess, and come to understanding. The PTB has learned if not mastered to manipulate “Mass Mind”, as distinct from “collective UNconsciousness” or even”collective consciousness”. From the days of old through Edward Bernays, one of the greatest applied psychologists in service to social engineering, through to those plying that trade TODAY. I assert and contend that understand basics of the Mind, its structures and functions (macro) will inform our investigations of “false flag events” and much more — for (((they))) operate in physical, mental, and spiritual domains. For this task, I refer to Yogi Bhajan’s treatises and seek to map that to on-going information and developments vis-a-vis France’s Cathedral of Notre Dame. I say, Montreal, Canada, WATCH OUT and PROTECT your own!!! Clever Christians pray the question – Who dun it? We should all start praying out loud that the Jews’ murder and destruction of western civilization wasn’t intentional. Well folks. Donaldos $666.66 of tequila is almost half empty. But I’ll be optimistic……half full. Shouldn’t such an historical landmark have security? In today’s police state their are surveillance cameras everywhere. Donaldo knows. He’s a trucker. Everytime I enter a major metropolis in the US cameras are on every traffic light saying, “Hola, Donaldo….. you’re being watched….🙄.” It would be impossible for such a landmark to be torched without a trail of evidence being left behind. Did a disgruntled tourist (Jew, Muslim…..or whatever) menacingly start the flames with the tip of an English Dunhill cigarette? It shouldnt be dificil to solve with a thorough investigation. Thee million-dollar question is….. 🥁 roll…..will such an investigation take place and inform the public? If not…..the public will know who the (((perpetrators))) might actually be. 🤔😉😎. JUST LIKE 9-11, we have prescient HorrorWorld predictive programming. Extraordinary prescience seems a function of planning! Now, how would a HorrorWorld movie maker know about that plan? Some kind of evil network? Jim Stone reported the Notre Dame Cathedral artistically shown as collapsing in I Pet Goat 2 and the (future?) ABSENCE of the cathedral mentioned in “Before Sunset | Notre Dame De Paris | Richard Linklater” [JS provided the link]. Jim continued, OUT TAKE: Muslims did not burn that Cathedral if the exact scenario it suffered was in I Pet Goat2, (including the spire collapse) and just like 911, movies referenced it’s destruction beforehand. Jim Stone has more, including his assessment of the burning with the Assange story (http://82.221.129.208/). Veterans Today (Gordon Duff, Robert Steele) have posted essays on who, how, and why. I read nothing I could disagree with. Duff and Company mourn with us. would it have been an accident that adequate fire watch was not in place during a major overhaul of such a structure? i mean, would you take any chances whatsoever of a fire breaking out on a project like that? and doesn’t the government of france and the catholic church understand france is full of hateful muslims now, and that somebody has already been setting fire to their churches? where was the security? the jews running the american state department in the obama administration wrecked north africa and loosed the flood of toxic immigrants into europe… now you got this… isn’t this how muslims have been taking over other people’s countries for centuries, ever since the whole phony baloney gangster-religion was made up? The imported Muslims are but a tool, as in the ME. The proud yellow vests have been burning Paris’ banks, this is simple retribution by the globalists. Much too easy to access ND while under construction. Even if by a now murdered patsy, who did this is obvious. Well if we’ll start jumping to conclusions, I’d say it’s rather the Muslims. Jews do a lot of damage but did Jews order the Teleban to bomb the giant Buddha statues in the mountain face? Jews may hate Christianity but Muslims hate all culture except their own. They have a track record of doing cultural damage like no others, from chopping off the heads of Greek statues to burning and desecrating churches all over. They don’t even respect Egyptian history and architecture, and only pay lip service to it because it brings in some tourists dollars, as well as providing infidel targets for the more extremist among them. Egyptian muslims, almost to a man, refer to the pyramids as “haram”. If you’re ever in Cairo and want to visit them just tell the taxi driver ” haram” and he’ll know where to take you. And it won’t be the brothels and boozer bars although they are situated very near. You are always whining about generalizations, but you love to generalize! The only difference is that you do it backwards. You take the ordinary, gullible, street level Jew and extrapolate your tiny little example in a futile attempt to portray all Jews the same way. It’s a kind of intellectual dishonesty. I think Donaldo has a far better approach than you have. who can tell/describe, what the people in black armour presently killing and maiming people in yellow vests on the streets of paris look like underneath it all ? ” they will never be able to work to support themselves”! I’m sure that someone has some “work” lined up for them. You proved my point and I thank you ! One may call it “Christianity”. But, in my opinion, what the Notre Dame Cathedral represents is not so much a particular faith, but the very essence of a people. Its greatness in architecture, grace, sculpture, painting and every other conceivable expression is the pinnacle of its creators’ souls. Johann Sebastian Bach’s non-secular creations portray this same ideal in music. Thus, the innate concern and subconscious angst that people feel over this recent conflagration are merely an empathic bond of European peoples the world over. I thought your comment was very good. I agree with what you said. the formerly White Western Civilization. JS: Not rumor: Michelle Obama was on a yacht with a bunch of other “elites” in the Seine river in sight of Notre Dame burning. Supposedly it is just “coincidence” and (she) is all sad. Oh well I guess, things are starting to stitch together here. NOT “MUSLIMS”. They just declared that the reason behind the fire wasn´t arson. every single one of the thirty eight comments above mine are …. Lol. It must be true then 😉 Why rely on precedent and logic when you can stop thinking and just accept “mainstream facts”? Oops; I keep forgetting I’m in self-imposed exile. Goodbye! Thank you for the links, especially the second. I had missed that today! GOD bless this ad hoc, lay investigation, second- and third-hand info gathering! The HITS just keep on comin’! Before our next set of tragedies, disasters, murders, let’s go to our intrepid reporter based in MEXICO. JIM STONE reporting intrepidly competently — first on the block with this suggestive, damning tidbit. Take it away, Jim! [NOTE: Pictures and links on Jim’s site (http://82.221.129.208/). The cruise departed AFTER the cathedral was already hurling smoke into the sky. This is proven by the reflections in the wine glass in this photo which shows a rather happy Michelle Obama. You can’t see the actual cathedral in this photo yet because the dinner cruise is not close enough yet. In this next photo (below), they are close to the burning cathedral, it is OBVIOUS WHAT THIS IS, and you can see the burning cathedral clearly reflected in Michelle’s wine glass. Other sites that found this only showed Michelle, and did not give the context which put all of this in doubt because after all, that photo could have been pasted onto that wine glass with a little photoshop. PROBLEM: This actually is an original photo that appeared in original form in THIS NEWS REPORT which proves it was not photoshop, that’s an actual photo in original form. LOOK AT THE PEOPLE ON THIS YACHT. THEY ARE NOT SAD AT ALL THAT THE CATHEDRAL IS BURNING, AND THE LOOK ON MICHELLE’S FACE IS ONE OF VINDICATION. SHE’S NOT SAD, SHE’S VENGEFULLY SATISFIED. THIS CINCHES IT – THE CRUISE WAS DONE TO WATCH THE CATHEDRAL BURN. THE PEOPLE ON THE BOAT SET THIS UP. Why would they get close enough to witness it like this? It is called a “victory tour”. IMPORTANT: The news report does not quote what is shown in the pictures in order or accurately at all, the photo where they are right up to the burning cathedral with it clearly showing in her wine glass is supposed to be from before she knew it was burning according to the reports, obviously because that chinese girl is very happy in the background and whoever wrote the report can’t look at a damn wine glass and was too stupid to know they wanted this. Alan here: I did a close examination of the wine glass reflection and the actual scene of the cathedral burning. Looks pretty convincing. Have at it, folks! My attempts to have forensic photography experts weigh in on such issues as “fake moon landing” and other photographic-intensive issues have always met with disdain, nasty epithets, and shunning. Perhaps someone here or there in the “clandestine services” might help us out. Hey, Gordon Duff! I can’t see the fire reflected in the Michelle Obama’s wine glass. I am limited in that my Internet connection is a smartphone with a 6 inch screen. But I can’t see the fire reflected in Michelle’s wine glass. I have come across a strong argument that arson, not accident, caused the Notre Dame fire. This argument comes from Stefan Molyneux of http://www.FreeDomainRadio.com. Molyneux is an intelligent man who has experience working with construction companies. He tells us that these companies ordinarily take great cautions regrading fire, and that in the case of the historical treasure of the Notre Dame cathedral a company of exceptional reputation would have been employed for the construction work, and that this company would have taken super precautions regarding fire, owing to the cultural value at risk; and that the ptobability of accidental fire from the construction work that was going on equaled ZERO! It HAD to be arson, according to Molyneux, for this reason. I think that is a good argument. As for who did it, I strongly suspect the Moslems over the Jews for the simple reason that the Jewish media is going to lengths to deny that arson caused the fire. If the Jews had done it they would have done it to blame it on the Moslems. They would therefore not be denying that arson caused the fire. I can’t understand how work of that kind could be carried out without an insurance bond, i.e., 500 million euros or some similar sum to guard against accident. Completion bonds are a common feature of all public works contracts. But now they’re scrambling around accepting donations from millionaires. This isn’t how things are normally done. I’ve translated enough public works contracts to know that. The company doing the work would normally be held liable but there is no discussion of that. I hear no mention of possible negligence or anything like that. Michael Hoffman has contributed more data. I think most of you know Michael’s works. I hope and trust this long-ish post from an “external source” proves valuable. There are numerous buildings in America that bear the name of Rabbi Moses Maimonides, the “sage” who is revered by liberal and Right wing intelligentsia in the West, notwithstanding the fact that Maimonides declared that Jesus got what He served when he was killed, Christian churches should be burned and black people are less than human. The Babylonian Talmud itself is the holiest book of Orthodox Judaism, replete with nullifications of the Bible, admonitions to lie, commit evil anonymously and destroy non-Jews. The Babylonian Talmud teaches that Jesus was a sorcerer, His Mother Mary a whore and that Jesus is in hell burning forever in hot excrement. It is important to keep in mind that many noble Judaic people object to the contents of the Talmud and have rejected it. Even with regard to the adherents of Talmudic Orthodox Judaism, Jesus commanded us to love our enemies and do good to those who persecute us. Only an enemy of Christ would perpetrate attacks on Judaic people. Telling the truth as Jesus did (Mark 7; Matthew 15), is sufficient; the rest we are to leave to God (Romans 12:19). Judaic people are the primary victims of Talmudic dogma. For instance, permission for the molestation of infant Judaic girls under the age of three and Judaic boys under the age of nine is granted in the Talmud. This is not a “canard” or a “trope.” This datum is not “taken out of context.” It is a readily verifiable, tragic and unfortunate truth. We wish it were not. Presumably it is still ethical and legal to advance human knowledge and publish demonstrable facts. The early and medieval Catholic Church did indeed oppose the Talmud, predicated in large part on the testimony of former Judaic Talmud scholars such as the learned Nicholas Donin, who converted to Catholicism and participated in the Paris debate with the rabbis. Centuries later however, during the Renaissance, the hierarchy of the Church of Rome was infiltrated and the popes began to covertly honor and emulate the rabbinic traditions and the doctrine contained in the Kabbalah and Talmud. For example, far from burning it, the finest edition of the Talmud up to that time, the Bomberg edition, waspublished under papal auspices in Renaissance Venice, circa 1519-1523. These revisionist facts are seldom mentioned in the controlled media or western academia, the better to keep people ignorant and maintain political purity and correctness, rather than knowledge. Of course I’m generalising and not talking about exceptions, of which there will always be some. But still Muslims may tolerate other cultures although few actually respect them. So even the early Muslim conquerors did not destroy all the cultural heritage that came before but they made sure they decapitated many Greek and Roman statues as it goes against their ideas about not drawing or carving images or something. That’s why their art consists mostly of geometric patterns. I wonder if you have access to the curriculum of what they teach in their madrassas or transcripts of what their muftis preach in their mosques; you will find very little tolerance for anything but their own in any of that, mostly scorn and hate. I find it strange that those who talk against Islam are labelled as “haters” while their mosques and maddrassas, true factories of hate, are allowed to operate freely and openly. Islam is an ideology of hate masquerading as a religion. Now of course in their own countries, where they have almost completely eliminated all other faiths and cultures, it is fine for them to teach and preach so, as there is nobody left there to suffer as a result of their hatred, but why you should want to import that elsewhere beats me. You probably know that mohammetans believe they have been given the directive by mohammed to take over the world. Ann Kathleen Corcoran (born 21 September 1951), an Australian politician, was an Australian Labor Party member of the House of Representatives from 12 August 2000 to the 2007 election, representing the Division of Isaacs, Victoria. The UN High Commissioner of Refugees is choosing most of our refugees. The UN Refugee Agency is under the influence of a powerful Muslim supremacist group called the Organization of Islamic Cooperation. Syed Abul Ala Mawdudi (1905-1979) world-renowned Islamic scholar who traced his paternal ancestry to Mohammed. Yes of course, and Islam will truly be a religion of peace when it covers the earth and everyone is Muslim and the world is Islam – Peace. Of course they may then start fighting amongst their sects. But they don’t have a hope in hell of achieving their aims as they are outnumbered by others, and Buddhists and Hindus sure won’t settle for any nonsense from them, but they’ll cause a lot of damage along the way. AND… graveyards are VERY peaceful! The hate book of Judaism is the Talmud. The hate book of Islam is not the Quran, but the Hadith, a deviation. As far as I know, Christianity doesn’t have a hate book. You need to be more specific when addressing this subject. In varying degrees, “Christianity” is Judaism in sheep’s clothing. E.g. ; In the OT there’s PLENTY of Talmudic hatefulness within its pages. The Christian Bible is sorely lacking in offering an accurate account of what is meant by the “Christ”. Nature, in its greatness, is not compartmentalized; we do it so we can study the puzzle peace by peace. In this particular case, in other to produce a less artificial fragmentation, I’m going to use time as the parameter. Since Jesus wasn’t even born when the OT and Torah were compiled, I would put them associated, exclusively, with the old religion of Judaism. Not jews, but Satanists. Give credit where credit is due. It matters not if Islam is involved. It is assumed, and the musselmen will do their worst. It’s the end of this world. Everything proceeds as was foretold. Trump turns into Bush over Iran. Likud holds on to power. Rothschild loses its petrodollar monopoly. These Evil Parasites are “choosen Devils” playin a dirty Game against the Peace Loving and majority People of the World. How long can they play this evil actions? Thei Evil Parasites can cheat the People of the World some times and they can cheat the People many Times, but they cannot cheat the People all of the Time. Well, rich people are giving billions of dollars already. Whereas, for hunger? Umm, who? Why would anyone pay for hungry people? For an old building? Yeah sure. It’s not for an old building that they’re sacrificing all that money. It’s for what the building represents: 800 years of history, of blood and tears, and of precious iconic art. This is not a warehouse full of old junk, you know. This contains the actual Crown of thorns Jesus Christ wore on Golgotha 2000 years ago. I can understand your narrow attitude if the sacred and the perennially beautiful mean nothing to you. To me and my dear brothers and sisters in Christ they mean a lot. Your contempt for the sacred leaves me cold. Marissa, whenever the hunger reflief ships/airplanes full of food for the hungry pull into port the food cargo is immediately commandeered by the politicians/army to be used as a bargaining tool. U.N. or other charity people be damned. They’re basically helpless at stopping this.. The reason there are hungry people is their rotten snake in the grass leaders are rotten snakes in the grass, not because there is a lack of food or a lack of charity. More often than not the countries where the relief food is being delivered already has enough food for everyone, but yep, same political bargaining tactics are at work. Competing factions. Bottom line, the devilish leaders/army don’t care if their own people starve if it serves their interests. Definitely the Exocets were most effective. The British press made such a big deal about it at the time as if the French had betrayed them although the French actually stopped all sales of military equipment to Argentina and assisted Britain’s expeditionary force in various ways, but it has recently come to light that their technicians continued to assist the Argentine air force. Officially USA claimed it was neutral but as you mentioned it did help the UK. My contention was that no big deal was made about this at NATO level which one would expect from their usual rhetoric. Strangely enough I just checked that Spain actually joined NATO in May 1982, during the very Falklands war, after it had abstained during a UN Security Council Resolution demanding the withdrawal of Argentine forces in April. Christian church attendance in many churches in America is declining. The majority of churches in America are not growing. The door for Islam recruitment is WIDE OPEN!! Churches have become too politicized. They tend to the libtards and “millennials” too much for traditional comfort. Raised a Methodist, I wrote to our pastor when in high school, stating that I was appalled that the United Methodist World Council was the largest SUPPORTER of Communist guerillas in Rhodesia, and that I no longer wanted to be considered a member of the congregation. Moreover, I learned that lately the diocese was debating whether or not to ordain LGBTs to the ministry. That a church would even entertain such prospects is enough to make me sick! The Prebyterians and Episcopaleans have gotten even worse. Catholics now have a rotten Pope, too. (How they could call him “Supreme Pontiff” is enough to make a true believer stay away.) Islam is looking more honorable, by comparison.